Just thought I would contribute this, I know in a weird way this is a re-post for the black prince rep grind, however, this is more directed to profession skilling. I have the perfect spot to farm. The best way to farm this solo imo is a) be a tank, b) if not tank, group up! If you stand with the temple to your back, run up the stairs either to the right or left, whilst on the "ledge" run to the stairs at the middle (opposite side to the temple) and pull all mobs to the bottom of the middle stairs, when you get there, pull left and right sides of the stairs into the path of the ox in the centre, do a bit of damage to them all before the ox mows them down, and boom! They all get creamed. I famed about 100 motes in about 15-20 minutes with 0 downtime due to being a paladin tank. Tip for paladin tanks, use seal of insight and spam hammer of righteousness. This will yeild hundreds of cloth in a very short space of time, and in the 15 - 20 minutes of my farming these mobs, I reached honoured with the black prince, picked up 4 meta gem recipes, lots of greens, lots of "gold drop" and most importantly, the motes of hamony. One other note, your reputation with the black prince stop going up after honoured when the pack of mobs die that you reached honoured with. For example, I now have 300 rep into honoured since I pulled scores of the mobs and they died at about the same time. Since the mobs award 10 rep per kill, if it had of been reputation on a "mob kill" basis, I would have stopped my rep going up at a max of 10/6000, instead I am about 300/6000, so, I suppose there is a possibility to exploit this too. Once again, I do not mean for this to be a repost. Just thought I would share this with the people who are looking to further their professions and may have over looked the other threads due to the title being "black prince farm"
Last edited by Meowman; 10-01-2012 at 07:33 AM. Can you make a screenshot of your position? I barely seen any mobs. Do I need to do any quests? The mobs are in the actual forecourt and also around the edges, just follow the ox, you will see mobs fighting around the outside. And yes, I will post an SS once I get home from work. There is a gigantic glowing white ox inside the temple, but he's untargetable and not doing much. I guess I have to do those quests. Indeed, seems quests are needed in that case, sorry i couldnt confirm. Seriously? I am getting 100+ every half hour and on top of thet tonnes and tonnes of cloth. Ill get a loot addon which makes a summary of what you have looted since you started tracking and get exact numbers / hour. I have done all the quests in TS, he is still running around trampling peeps for me. Tried this on EU and got 4 in 30 minutes, cloth is the only good thing that drops but it is usless on my realm as it sells for 30g a stack in the AH. T.T 8g/stack on my server. no idea what quest you have that might have awoken him but it could be Defense At Niuzao Temple? 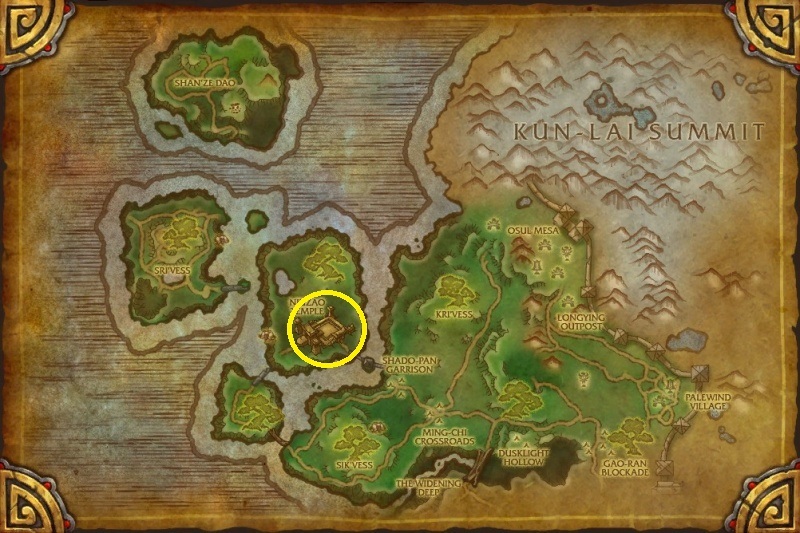 [How-To] Motes of Harmony + Turtle meat farming spot, fast respawn.